Informal Family Communion – 09:30: On the first and third Sundays of each month we have an Informal Family Communion. This is an all age worship service with teaching using multimedia and interaction. It is child friendly and is appreciated by a wide and diverse group of people. 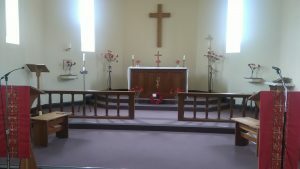 Sung Eucharist – 09:30: On the second, fourth and fifth Sundays in each month our worship is slightly more formal but still welcoming and friendly. Everyone is welcome at any of our services – we are an inclusive church and would love to meet you!